It's Groundhog Day - that is the first thing that crossed my mind when my alarm went off on Friday morning for the Royal Family 5K. 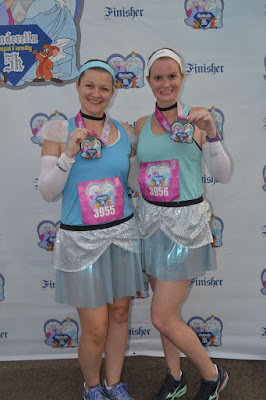 After four back to back Disney races in January during the Dopey Challenge, my body was fully prepared for runDisney Princess weekend but I'm not quite sure my mind was! I was very fortunate this weekend and had the opportunity to stay on property at Animal Kingdom Lodge. Since we had transportation to Epcot, we had to board the bus no later than 5am for the 6:30 start on Friday morning. Although I stayed on property for Wine and Dine Half Marathon a few months ago, this is the first time I had transportation deadlines inn the morning so that was a bit of an adjustment (not a morning person)! I now see and appreciate why it is better to stay on property for a runDisney race - convenience is everything. If you follow this blog, you already know that I ran the Royal Family 5K with my friend (and co-worker) Nicole. We started our running journey together at this very race 2 years ago and have both accomplished 2 full marathons and after Sunday, 8 half marathons. 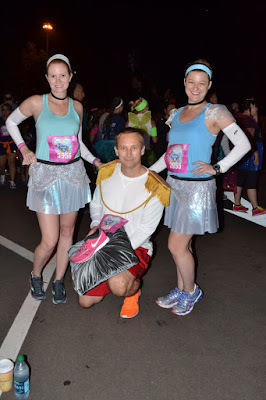 We decided to dress up as Cinderella for this race, as it was Cinderella's Royal Family 5K! When I mentioned to Nicole a few weeks ago that we should honor our two year race anniversary by completing the 5K, she agreed and I couldn't be any happier! While we do many of the same races, we don't get to run together that often and we had a great 3.1! Prior to the race, we saw a lot of Prince Charming's. This one with a sneaker was definitely a photo opp waiting to happen! This was the third 5K I have done in Disney with this course. It is my favorite 5K course anywhere in history. We start outside of Epcot, do a loop around the parking lot and mile 1 is right outside of the park. We enter through Epcot at sunrise which is an amazing peaceful time in the park. The photo opps are endless as the worlds are all lit up. If you are looking to get into running or are looking to runDisney, the 5K is how to start. My friend Christine ran her first Disney 5K on Friday (she completed the Full Marathon in January) and was so excited about how fun this course is. We only stopped for one character during the 5K course - BEAST! I was so excited to see him there. We would have stopped for others but a lot of the characters out were the same from the Dopey Challenge 5K or 10K. I saw many outfits that were blog worthy but this one took the cake and I am so mad I didn't get a pic with him. Princess Jas-MAN. He was wearing a tutu and a womens shirt. While most men couldn't get away with wearing a tight form fitting ladies shirt....well let's just say I will keep this family friendly. Moving on! Now, if you have ever ran a runDisney race in Walt Disney World, you are familiar with post race photos. We stand in line for a finishers photo w/ the medal just earned. Always having to place your water, powerade, arm bands, phones, camera's, etc. on the floor. Not this year!!! There were high top pub tables available to place our stuff on. THANK YOU runDisney and Marathonfoto for that. Seriously, the little things make people happy and this was one of them. Nicole and I went ahead and took this photo together as I am not sure if we will see each other post race on Sunday. 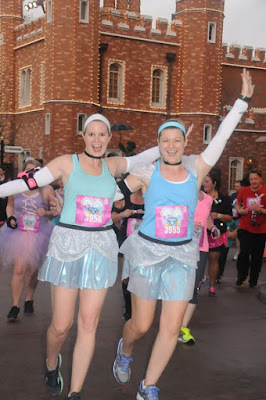 I cannot say how thankful I am for Nicole - we have pushed each other so far over the past two years and our friendship has grown from our love of running (and runDisney). I encourage any new runner out there to get a runner buddy and I suggest not your significant other or best friend as those are people you can make excuses to and slack off with. I am looking forward to today's inaugural runDisney Enchanted 10K! Be on the lookout tomorrow for that recap. Looks like you girls had fun, sorry I didn't get to do this one with you two.